Background: Hypokalemic paralysis is characterized by episodes of acute muscle weakness associated with hypokalemia. In this study, we evaluated the possible etiological factors in patients of hypokalemic paralysis. Materials and Methods: We reviewed the records of 29 patients who were admitted with a diagnosis of hypokalemic paralysis. Modified Guillain-Barre΄ Syndrome disability scale was used to grade the disability. Results: In this study, 15 (51.7%) patients had secondary causes of hypokalemic paralysis and 14 patients (42.3%) had idiopathic hypokalemic paralysis. Thyrotoxicosis was present in six patients (20.6%), dengue infection in four patients (13.7%), distal renal tubular acidosis in three patients (10.3%), Gitelman syndrome in one patient (3.4%), and Conn's syndrome in one patient (3.4%). Preceding history of fever and rapid recovery was seen in dengue infection-induced hypokalemic paralysis. Approximately 62% patients had elevated serum creatinine phosphokinase. All patients had recovered completely following potassium supplementation. Patients with secondary causes were older in age, had significantly more disability, lower serum potassium levels, and took longer time to recover. Conclusion: In conclusion, more than half of patients had secondary causes responsible for hypokalemic paralysis. Dengue virus infection was the second leading cause of hypokalemic paralysis, after thyrotoxicosis. Presence of severe disability, severe hypokalemia, and a late disease onset suggested secondary hypokalemic paralysis. There is a paucity of literature regarding the clinical and etiological spectrum of hypokalemic paralysis from tropical countries. In this retrospective study, we analyzed the clinical features and underlying causes of hypokalemic paralysis in 29 patients who were admitted in a tertiary care hospital. In this study, we analyzed the records of all hypokalemic paralysis patients who were admitted in a tertiary care facility from January 2009 to August 2011. The study protocol was approved by the Institutional Ethics Committee. The institutional review board issued a waiver of informed consent as the data used in the study was collected as part of the participants' routine care. Hypokalemic paralysis was defined as an acute-onset flaccid paralysis associated with low plasma potassium (<3.5 mEq/L). Hypokalemic periodic paralysis was characterized with recurrent attacks of weakness in association with hypokalemia. Thyrotoxic hypokalemic periodic paralysis was defined as occurrence attacks of acute flaccid paralysis and low serum K+ concentration in the presence of hyperthyroidism confirmed by thyroid function tests. ,, Patients of hypokalemic paralysis where no cause was identified were classified as having idiopathic hypokalemic paralysis. Familial hypokalemic paralysis was included in the idiopathic hypokalemic paralysis group. Patients with demonstrably known causes were classified as secondary hypokalemic paralysis. Patients of thyrotoxic periodic paralysis were included in the secondary hypokalemic paralysis group. 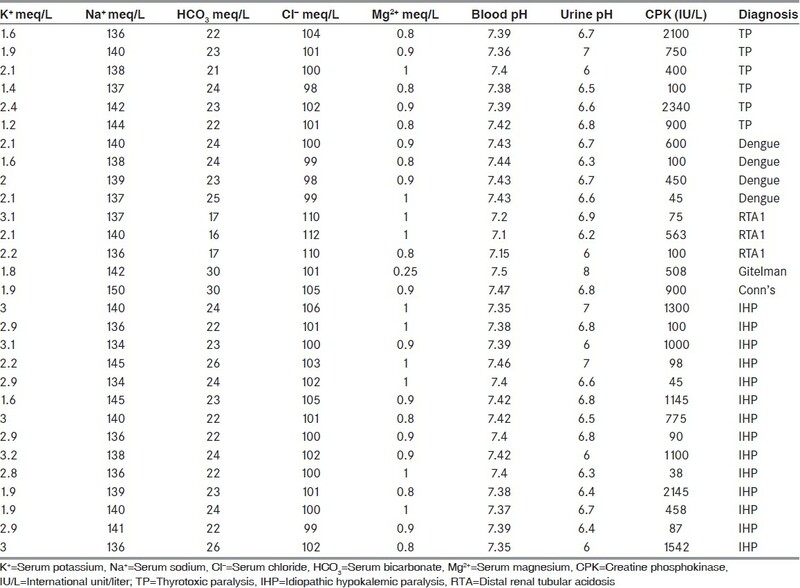 A battery of laboratory tests, which included complete hemogram, serum sodium, potassium, bicarbonate, chloride, magnesium, serum creatinine, fasting serum calcium and phosphate, serum albumin, globulin, alkaline phosphatase, creatine phosphokinase (CPK; laboratory reference value = 24-195 IU/L), arterial blood gas analysis, and renal and liver function tests, was performed. Fasting urinary pH, 24 h urinary calcium, phosphate, and creatinine were also performed. Electrocardiogram and cardiac evaluation records were reviewed. Patients were subjected to thyroid function tests. Immunoglobulin Mantibody-capture enzyme-linked immunosorbent assay or dengue viral antigen non-structural protein-1 detection was used to detect dengue virus infection. Nerve conduction studies were performed in all the patients after they recovered. Needle electromyography was performed after full recovery in 11 patients. Thyrotoxicosis was defined as suppressed thyroid stimulating hormone level with high free T 4 and/or free T 3 levels. Distal renal tubular acidosis (RTA) was characterized by hypokalemia, hyperchloraemic metabolic acidosis, and inability to lower the urine pH below 5.5. The diagnosis of proximal RTA is based on the demonstration of a chronic hyperchloraemic metabolic acidosis and an acid urine pH <5.5. Patients with proximal RTA had a plasma bicarbonate concentration more than 15 mEq/L. The diagnosis of Gitelman syndrome was made in the presence of metabolic alkalosis, hypokalemia, hypomagnesaemia, and hypocalciuria. Primary hyperaldosteronism or Conn's syndrome was diagnosed in the presence of hypertension with hypokalemia and alkalosis, with supportive evidence of high serum aldosterone level and a characteristic computed tomography of the adrenal glands. Data analysis was carried out with SPSS software (version 16.0). Statistical analysis of categorical variables was carried out using Fisher's exact test or the Chi-square test. Independent t-test or the Mann-Whitney U test was used for continuous variables. A value of P0 ≤ 0.05 was considered significant. During the study period, 33 patients with a diagnosis of hypokalemic paralysis were admitted in our department. In two patients who were taking loop diuretics and in two other cases adequate etiological work-up were not available, and hence were excluded. A total of 29 patients were included for final analysis. The mean age, at presentation, was 27.6 years (range 16-47 years). Majority of patients were male (26 male; 89.5%). Seven patients had a history of similar episodes in the past. The mean duration of illness in patients having a past history of similar episodes was 12.7 months (median 9 months; range 4-30 months) and they had a median of 6 episodes (range 3-15). One of them was a previously diagnosed case of recurrent hypokalemic paralysis and was taking potassium supplementation along with acetazolamide; he was later diagnosed as a case of thyrotoxicosis [Table 1] and [Table 3]. Ten patients had myalgia and eight patients had a history of fever prior to development of weakness. Two patients had a family history of similar illness. One patient with idiopathic and two patients with secondary hypokalemic paralysis had respiratory involvement; none of them required ventilatory support. 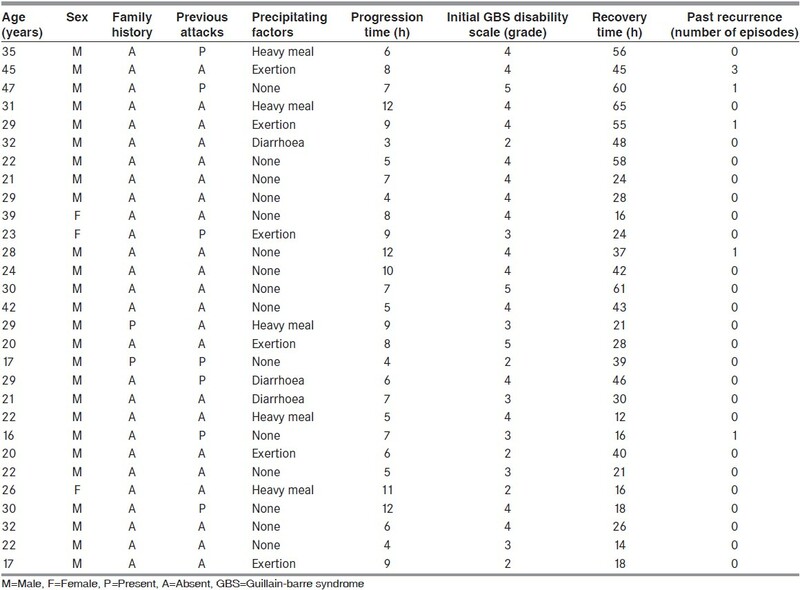 All patients had presented with quadriparesis and 24 patients had a grade ≥3 measured on the GBS disability scale. The mean time from onset to maximum weakness was 7.3 h ± 2.5 h. Deep tendon reflexes were absent in 5 patients and 11 patients had hypoactive but demonstrable deep tendon reflexes. Sensations were normal in all the patients. Nerve conduction studies were normal in all the patients. They were performed only after full recovery [Table 3]. Serum potassium level at the time of presentation ranged between 1.2 mmol/L and 3.2 mmol/L (mean 2.30 mmol/L; median 2.1 mmol/L). Thyrotoxicosis was present in six patients and dengue virus infection in four patients. Three patients had acidosis, and alkalosis was present in two patients. Hypomagnesaemia was present in one patient and hypocalcaemia in six patients. Nephrocalcinosis was present in two patients and electrocardiographic changes (ST changes and prominent U waves) of hypokalemia were noted in 15 patients. Serum CPK (more than 174 units/L) was elevated in 18 patients. Hypertension was present in one patient, who was later diagnosed as having Conn's syndrome [Table 1],[Table 2] and [Table 3]. Hypokalemic paralysis was categorized as idiopathic in 14 (48.3%) patients and secondary in 15 (51.7%) patients. The idiopathic category also included two probable familial cases of hypokalemic paralysis. In the secondary hypokalemic paralysis group, thyrotoxicosis was present in six patients (20.6%), dengue virus infection in four patients (13.7%), distal RTA in three patients (10.3%), Gitelman syndrome in one patient (3.4%), and Conn's syndrome in one patient (3.4%). Patients with mild to moderate hypokalemia were managed with oral potassium supplementation; patients with severe hypokalemia (serum potassium <2 meq/L) or who were not able to take anything orally or patients with potentially life-threatening disease (cardiac arrhythmia, respiratory compromise) were treated with intravenous therapy. The dose for oral supplementation was 20-25 meq/6 hourly and for intravenous treatment it was 40 meq/4 hourly given in 20% mannitol as slow infusion. Patients of thyrotoxicosis were additionally treated with carbimazole and propranolol. Patients with idiopathic hypokalemic paralysis having recurrent attacks were also given acetazolamide (250 mg thrice daily). All the patients improved completely (Grade 0 on GBS disability scale) after potassium supplementation. The mean recovery time (start of potassium supplementation to complete recovery) was 34.7 h.
Patients with idiopathic hypokalemic paralysis were significantly younger compared to those with secondary hypokalemic paralysis. Patients with secondary hypokalemic paralysis had significantly more disability (P = 0.025) and significantly lower serum potassium levels ( P = 0.001). Patients with secondary hypokalemic paralysis took more time to recover completely (44.13 + 15.5 vs. 24.6 + 10.7 h; P = 0.001) and the duration of hospital stay was significantly prolonged (2.71 + 0.72 vs. 3.26 + 0.59 days; P = 0.033) [Table 3]. None of the patients died during follow-up (median 12 months, ranging from 2 months to 28 months). Five patients had recurrence during the follow-up period. Three of them had thyrotoxicosis, one patient had distal RTA, and one had idiopathic hypokalemic paralysis. None of the patients with dengue infection had recurrence during follow-up (median 7 months, ranging from 4 months to 9 months). Hypokalemic paralysis is known to be associated with dengue virus infection. , In our series, dengue virus infection was an important cause for hypokalemic paralysis. Four of our patients had hypokalemic paralysis due to dengue infection. Myalgias are frequently associated with dengue virus infection. The main mechanism postulated for hypokalemia in dengue infection is the redistribution of potassium in cells. It has been suggested that the stress of infection leading to catecholamine release or hyperinsulinemia may result in intracellular shift of potassium, which in turn that may cause hypokalemia. , None of these patients had recurrence during follow-up. However, a long follow-up study will be required to understand whether dengue hypokalemic paralysis patients had a tendency for recurrent episodic weakness such as thyrotoxicosis hypokalemic paralysis. A genetic defect also needs to be explored. In our study, all the patients had recovered completely. Familial hypokalemic paralysis is an autosomal dominant condition. The symptoms usually begin before the age of 25 years and a male preponderance is observed. Attacks may be precipitated by a carbohydrate-rich meal (secondary to insulin secretion) or physical exertion. In our study, five patients had a history of taking carbohydrate-rich meal and six patients had a history of heavy exertion prior to development of weakness. Identifying and avoiding triggers of attacks are important in the management of hypokalemic paralysis. Triggers have been reported to precipitate paralysis. The most important triggers are rest after exercise and carbohydrate-rich meals. Diarrhea can lead to potassium loss and subsequently hypokalemia. Hypokalemia is also common in patients who have fever. Fever-induced hypokalemia may be due to low caloric intake, excessive vomiting, excessive sweating, administration of chloroquine and other drugs, and adrenergic hyperactivity. Other precipitating factors include cold, upper respiratory tract infections, lack of sleep, fatigue, intake of Chinese food, alcohol, dehydration, startle, drugs, menstrual cycle, change in humidity or barometric pressure, and change in daily activity patterns. Some of these triggers were present in our patients as well. More than half of our patients of hypokalemic paralysis had some secondary etiology. Dengue infection was an important cause of hypokalemic paralysis. Presence of severe disability and severe hypokalemia suggested a secondary cause of hypokalemic paralysis. 1. Lin SH, Lin YF, Halperin ML. Hypokalaemia and paralysis. QJM 2001;94:133-9. 2. Venance SL, Cannon SC, Fialho D, Fontaine B, Hanna MG, Ptacek LJ, et al. The primary periodic paralyses: Diagnosis, pathogenesis and treatment. Brain 2006;129:8-17. 3. Gilbert J, Saheecha SY, Oguntolu V. Acute global limb weakness. BMJ 2011;342:d1516. 4. Alkaabi JM, Mushtaq A, Al-Maskari FN, Moussa NA, Gariballa S. Hypokalemic periodic paralysis: A case series, review of the literature and update of management. Eur J Emerg Med 2010;17:45-7. 5. Jha S, Ansari MK. Dengue infection causing acute hypokalemic quadriparesis. Neurol India 2010;58:592-4. 6. Gupta DK, Vaish AK, Arya RK, Chaudhary SC. Hypokalaemic quadriparesis: An unusual manifestation of dengue fever. BMJ Case Rep 2011:pii: bcr1220103673. 7. Rampal, Sharda M, Meena H. Hypokalemic paralysis following Chikungunya fever. J Assoc Physicians India 2007;55:598. 8. Ahlawat SK, Sachdev A. Hypokalaemic paralysis. Postgrad Med J 1999;75:193-7. 9. Rao N, John M, Thomas N, Rajaratnam S, Seshadri MS. Aetiological, clinical and metabolic profile of hypokalaemic periodic paralysis in adults: A single-centre experience. Natl Med J India 2006;19:246-9. 10. Anonymous. 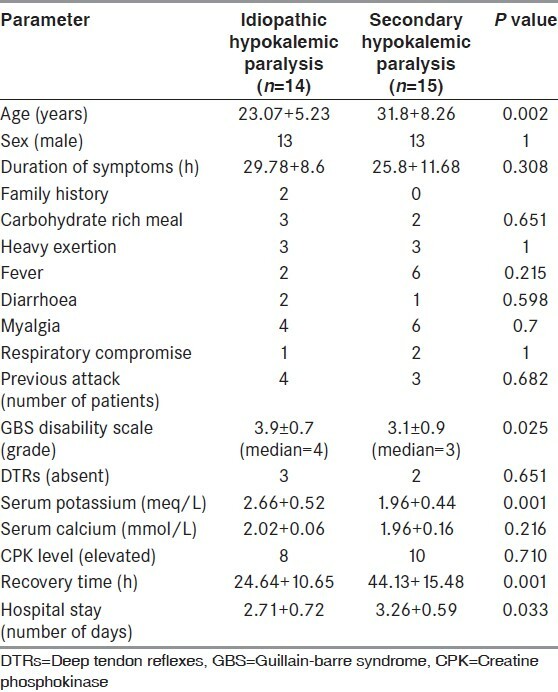 Appropriate number of plasma exchanges in Guillain-Barré syndrome. The French Cooperative Group on Plasma Exchange in Guillain-Barré Syndrome. Ann Neurol 1997;41:298-306. 11. Lin SH, Lin YF, Chen DT, Chu P, Hsu CW, Halperin ML. Laboratory tests to determine the cause of hypokalemia and paralysis. Arch Intern Med 2004;164:1561-6. 12. Schwartz WB. Disorder of fluid, electrolyte and acid-base balance. In: Besson PB, Mcdermott W, Wyngarden JB, editors. Cecil Text Book of Medicine. 15 th ed. Philadelphia: W.B. Saunders Co; 1979. p. 1957. 13. Arya SN. Periodic paralysis. Journal of Indian Academy Clinical Medicine 2002;3:374-82. 14. Gulati S. Dengue infection causing acute hypokalemic quadriparesis. Neurol India 2011;59:143. 15. Winer JB, Hughes RA, Osmond C. A prospective study of acute idiopathic neuropathy. I. Clinical features and their prognostic value. J Neurol Neurosurg Psychiatry 1988;51:605-12. 16. Singh NK, Jaiswal AK, Misra S, Srivastava PK. Assessment of autonomic dysfunction in Guillain-Barré syndrome and its prognostic implications. Acta Neurol Scand 1987;75:101-5. 17. Ng KK, Howard RS, Fish DR, Hirsch NP, Wiles CM, Murray NM, et al. Management and outcome of severe Guillain-Barré syndrome. QJM 1995;88:243-50. 18. Lin SH. Thyrotoxic periodic paralysis. Mayo Clin Proc 2005;80:99-105. 19. Lin SH, Chiu JS, Hsu CW, Chau T. A simple and rapid approach to hypokalemic paralysis. Am J Emerg Med 2003;21:487-91. 20. Maurya PK, Kalita J, Misra UK. Spectrum of hypokalaemic periodic paralysis in a tertiary care centre in India. Postgrad Med J 2010;86:692-5. 21. Unwin RJ, Luft FC, Shirley DG. Pathophysiology and management of hypokalemia: A clinical perspective. Nat Rev Nephrol 2011;7:75-84. 22. Levitt JO. Practical aspects in the management of hypokalemic periodic paralysis. J Transl Med 2008;6:18. 23. Wolf P, Griffiths J, Koett J, Howell J. The presence of serum creatine kinase 2 (MB) in hypokalemic familial periodic paralysis. Enzyme 1979;24:197-9. 24. Wiggers P, Nørregaard-Hansen K. Myoglobin, creatine kinase and creatine kinase subunit-beta in serum from patients and relatives with hypokaliaemic familial periodic paralysis. Acta Neurol Scand 1985;71:69-72. 25. De Keyser J, Smitz J, Malfait R, Ebinger G. Rhabdomyolysis in hypokalaemic periodic paralysis: A clue to the mechanism that terminates the paralytic attack? J Neurol 1987;234:119-21. 4 Dengue-associated hypokalemic paralysis: Causal or incidental?